From 2003 to 2004, I lived in Ecuador. I spent the majority of that year teaching English as a Second Language in the coastal town of Manta, but my first month in the country I lived with a host family while I attended teacher training in Quito. It was during that month that my host family took me north of Quito to the small town of Otavalo. Known for its busy markets and vibrant textiles, Otavalo is a quick daytrip from Quito and a popular tourist destination for travelers looking to explore a bit more of the Andes and pick up gifts for everyone back home. It was also the location of a traditional Ecuadorian restaurant owned by a relative of my host family. I don’t remember much about the night that we spent in Otavalo. I had arrived in Ecuador only days before and speaking a different language, adjusting to a new culture, and meeting new friends on top of classes on how to teach ESL had left me exhausted. Traveling to Otavalo was actually the last thing on earth I wanted to do (sleep being the first), but not wanting to be a poor sport, I gamely said yes and packed my bags for the trip. Clearly a sign that my Spanish needed lots of work, I missed the part about us actually working in the restaurant, but upon our arrival I rolled up my sleeves and started shaping llapingachos. It was the first time I tried these cheese-filled potato cakes, but not the last. 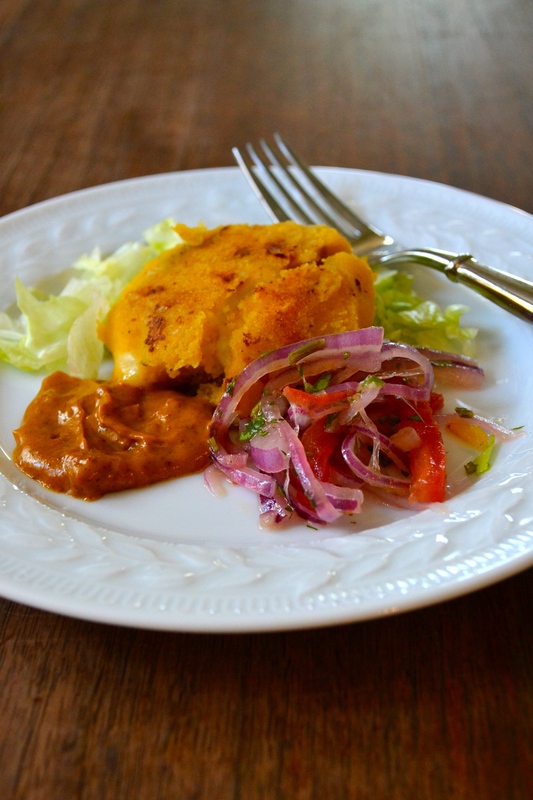 Llapingachos served with rich salsa de mani (peanut sauce) and a bright, acidic tomato and onion relish atop crisp iceberg lettuce are popular all over Ecuador on their own or as a filling side dish and I ate many of them during the year I lived there. Today, making llapingachos in my own kitchen, I wish I had paid more attention to my hands-on lesson over 10 years ago, although I like to think that my hands remembered instinctively knew what to do. The dish itself certainly brought back memories including nibbling the leftovers of my handiwork from a grease-stained napkin in the back of a pick-up truck. 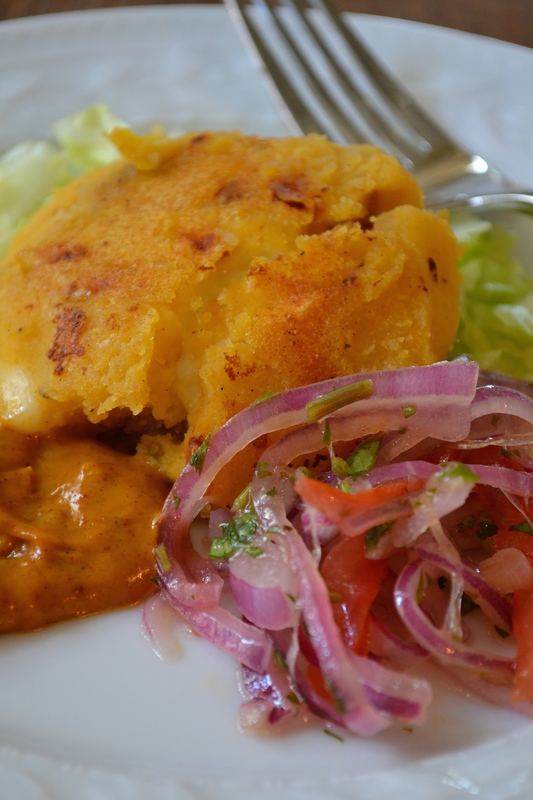 Our trip to Otavalo ended with my host family’s car giving up on the road back to Quito and we were glad for some hearty nourishment as we hitched a ride home in the cool night air of the Andes. A popular spice in Latin America, annatto or achiote is a hard, rusty red seed that lends a distinctive color and smoky flavor to foods. Most Latin American grocery stores carry it in whole, ground or paste form. While not familiar to most Americans, annatto is used to add color to pantry staples such as butter and cheese. Place the potatoes in a medium saucepan and cover with cold, well-salted water. Bring to a boil over medium-high heat and cook for 18 to 20 minutes or until the potatoes are soft and easily pierced with a fork. While the potatoes cook, heat the vegetable oil in a small skillet over medium heat. Add the chopped white onion and ground achiote and cook, stirring frequently, until soft (about 5 minutes). Set aside. Drain the cooked potatoes and place them in a large bowl. Mash the potatoes with a potato masher until smooth then stir in the seasoned onions. Taste the mixture and season to taste with salt and freshly ground black pepper. Line a baking sheet with parchment paper. Shape the potatoes into equal-sized balls (just bigger than a golf ball – you should get about 15) and place them on the parchment-lined baking sheet. 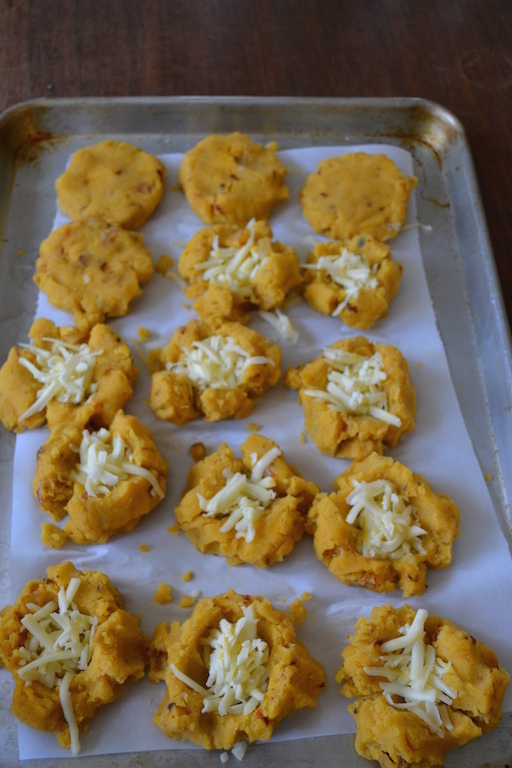 Use your thumb to create a space in the middle of each ball and fill it with about ½ tablespoon of grated cheese. Gently shape the ball into a patty covering the cheese with the potato mixture as you shape it. Set aside or refrigerate until ready to cook. To make the salsa de mani, heat two tablespoons of vegetable oil in a small saucepan over medium-high heat. Add the onion, achiote, and cumin and cook, stirring often, until the onion has softened. Stir in the garlic and cook until fragrant, about 30 seconds. Whisk in the peanut butter and milk and bring to a simmer. Season to taste. Remove from the heat and cover until ready to use. To prepare the curtido, sprinkle the kosher salt over the red onion slices in a small bowl and rub the salt into the onions with your hands. Let sit for at least 10 minutes. Rinse the onions with cold water and allow them to drain in a fine mesh-strainer. Combine the drained onions, sliced tomato, cilantro, olive oil and lime in a medium bowl and toss to combine. Adjust the seasonings as needed and refrigerate until ready to serve. Preheat the oven to 250 degrees. 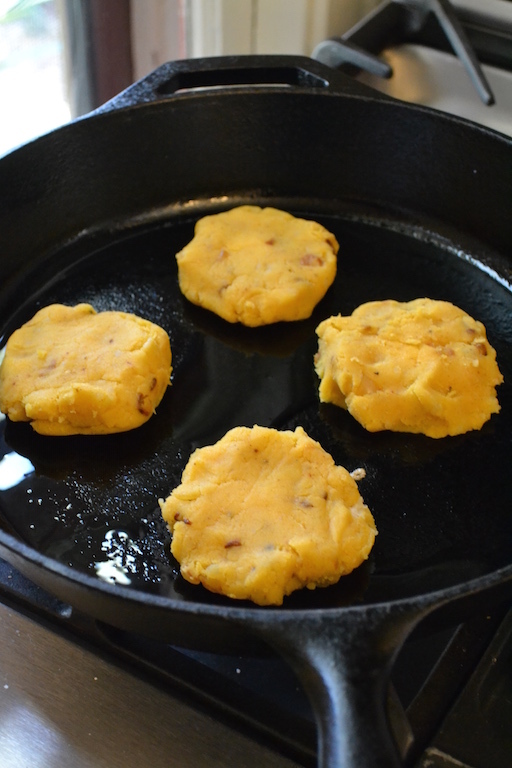 To cook the llapingachos, heat a heavy-bottomed skillet or griddle over medium heat. Add just enough oil to lightly coat the skillet or griddle using a brush to distribute it evenly if needed. 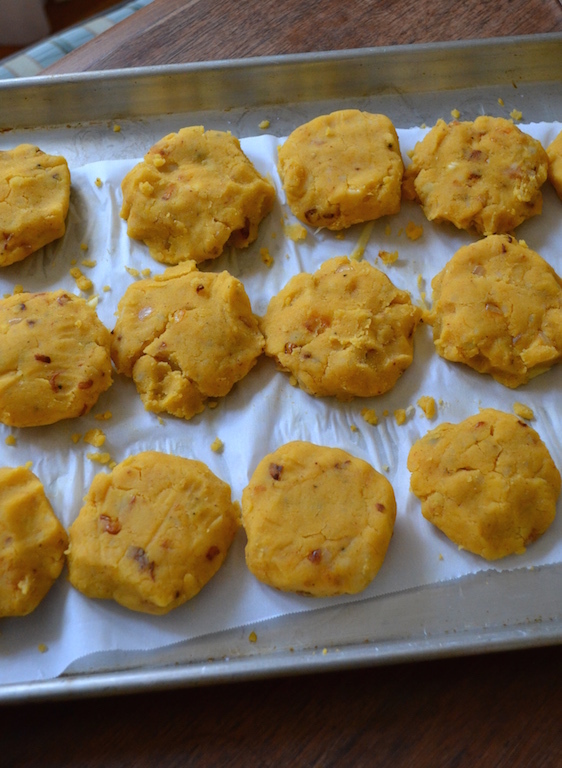 Lightly brush both sides of the llapingachos with oil to prevent sticking. Cook the llapingachos in batches for about 3 minutes on each side or until golden brown and the cheese inside has melted. Keep warm in the preheated oven while you prepare the remainder. While the llapingachos cook, reheat the salsa de mani over low heat. If too thick, add a little more water. To serve, place the llapingachos on a bed of chopped iceberg lettuce and garnish with salsa de mani and curtido de cebolla y tomate.